Created as a collaboration between Boeing and UC students and faculty, Boeing Onboard is an interactive in-flight virtual assistant. The rendering above shows what users would see using virtual reality glasses. Air travel can be a pretty disconnected experience. Often times passengers are left without typical phone and internet capabilities and a limited choice in entertainment options to pass the time. Meanwhile, flight attendants are stretched too thin to cater to the needs of many travelers, from safety instructions to drink orders. That could all change thanks to research done at the Live Well Collaborative, a partnership between the University of Cincinnati and Procter & Gamble (P&G) that works with industry leaders and UC students and faculty to form multidisciplinary design project teams. 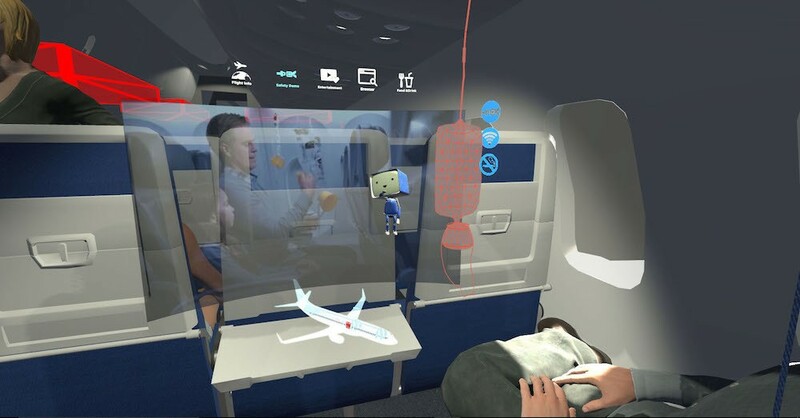 Developed as part of a semester-long Live Well project, Boeing Onboard is an in-flight concierge service created with virtual reality (VR) and augmented reality (AR) technologies. 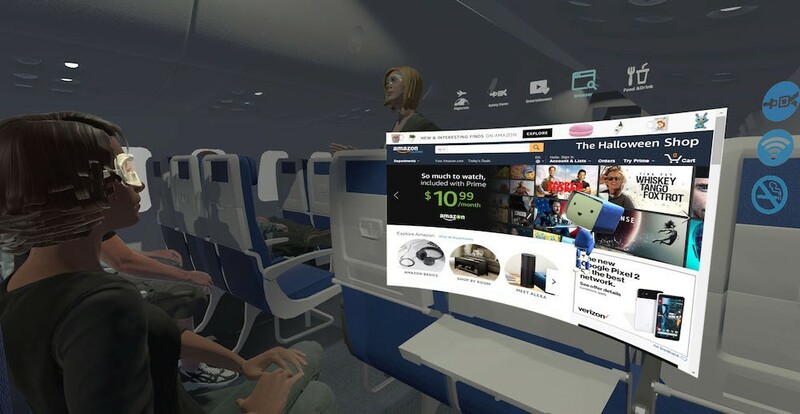 Using a VR headset, passengers are guided through a variety of options and services throughout their flight with the help of a virtual assistant. Like Alexa or Siri, this system could walk users through the in-flight safety demo, help them order a meal and make travel arrangements. This VR gear also takes in-flight entertainment to the next level and might even make your seat seem larger. While Boeing is not quite ready to implement their work, the company has filed a provisional patent on the application. It also submitted the project for the Crystal Cabin Award, the only international award for excellence in aircraft interior innovation. The awards are announced during the Aircraft Interiors Expo, where researchers will present the project April 10-12 in Hamburg, Germany. UC’s work made it to the short list of 91 submissions and is now one of 24 finalists for the award. UC students work on virtual reality projects at the Live Well Collaborative. The Live Well Collaborative was co-founded by Craig Vogel in 2007 in partnership with P&G, which was looking to focus on the underserved 50-70 age range of consumers. Live Well combined Vogel’s roles in the College of Design, Architecture, Art, and Planning (DAAP) — associate dean of research and graduate studies and director of the Center for Design Research Innovation — with his experience researching accessible design for the 50-and-older market. For more than a decade, Live Well has connected industry leaders with UC students and faculty to collaborate on innovative design projects. Corporations such as Boeing, P&G and Cincinnati Children's Hospital Medical Center frequently work with the collaborative to create new products and services for various markets. “Companies were looking for a new strategy that bypassed all of these intellectual property issues,” explains Vogel. Today there is also a Live Well Collaborative in Singapore, one of P&G’s global hubs, based out of Singapore Polytechnic. Boeing joined the stateside Live Well in 2010 thanks to connections made in Singapore. Since then, the aircraft company has worked on 11 semester-long projects with UC, resulting in seven different patents. “If you put students together with faculty in a context to see a problem in a completely fresh, new way, you will get innovation perceptions that are not possible in any other way,” Vogel says. Blake Lane is a doctoral design research fellow at Live Well who works full time leading and managing projects. In spring 2017, he led students who applied to Live Well on a few different projects for Boeing. One group was particularly interested in virtual reality, and that team ended up creating Boeing Onboard. 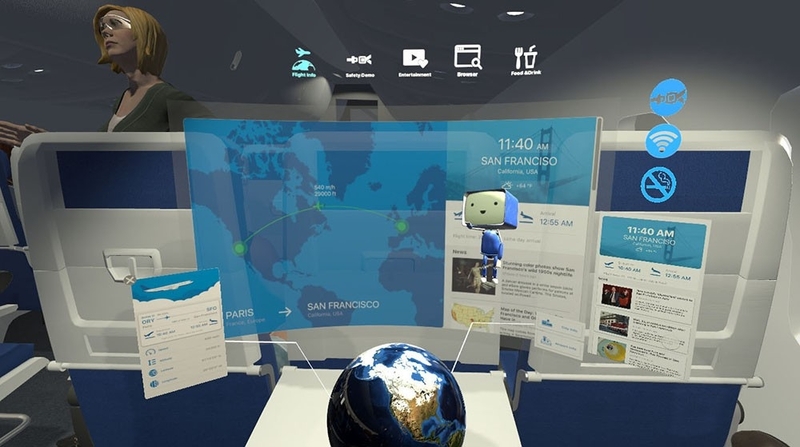 The framework for the project was already in place — Boeing had already approved a virtual reality concept — but the students were able to visualize the application to excellent results. 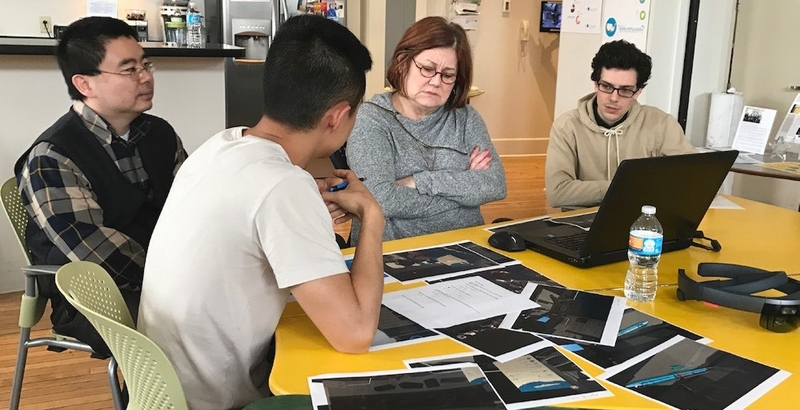 This team included industrial design student Andrew LeTourneau (DAAP ’17), master’s of design degree graduate Jack Qi (DAAP ’17), computer science student Ivan Klus (CEAS ’18) and Ming Tang, associate professor in DAAP’s School of Architecture and Interior Design. Boeing's Cynthia Vandewall presents UC computer science student Ivan Klus with a patent award at the Live Well Collaborative. Multidisciplinary work is at the core of Live Well, and Klus says he enjoyed working with students outside of his computer science major. Klus became interested in virtual reality technologies after getting to try a VR headset at a UC hackathon, a 24-hour coding competition where caffeine-fueled students create websites, mobile apps or hardware hacks. It was his work at a hackathon that drew the attention of Live Well. 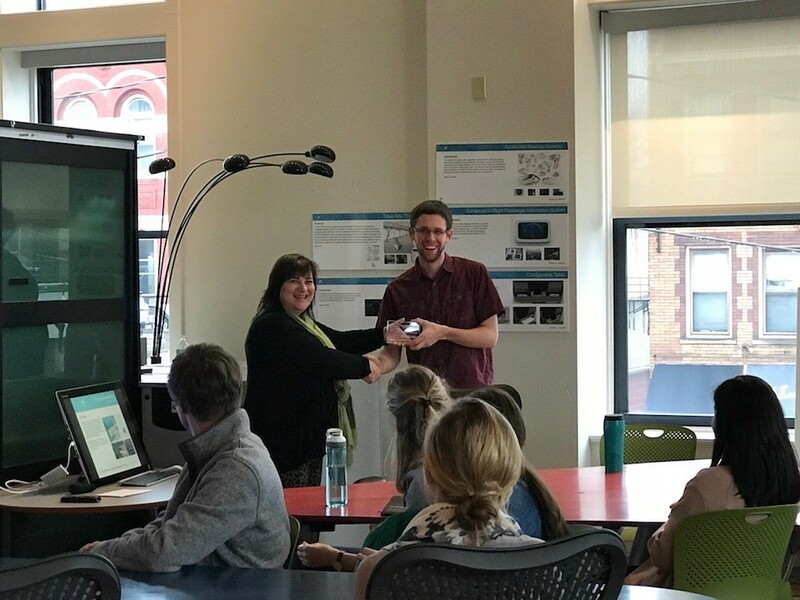 When Klus showed his VR project to collaborative executive director Linda Dunseath, he was hired for a co-op on the spot. 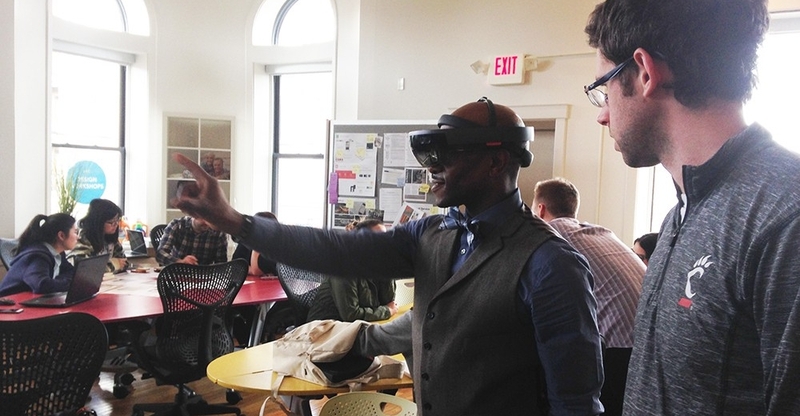 He also worked with Live Well on a VR project for Cincinnati Children’s, creating a virtual tour of the hospital’s regional campus, while he was on the Boeing project. Additionally, Klus’ name — along with the other UC students and faculty – is on Boeing’s patent, making for an excellent resume booster. With Boeing Onboard, users can shop online, order food and beverages or make travel plans all with a holographic interface. Klus walks a flight attendant through an interactive demo of Boeing Onboard using a VR headset. DAAP professor Ming Tang’s specialty in design visualization, using interactive media like VR and AR to communicate a design concept, made him a perfect fit for this project. So what is the difference between virtual and augmented reality? Virtual reality is completely computer-generated, so everything seen through a headset is a totally simulated world. Augmented reality overlays computer graphics on the real-world landscape. The best example of AR is the mobile game Pokemon Go, the 2016 hit that utilizes the player's GPS to find virtual characters in real-world locations, whether it be a park, a landmark or even on UC’s campus. The Live Well team used both technologies while developing Boeing Onboard. 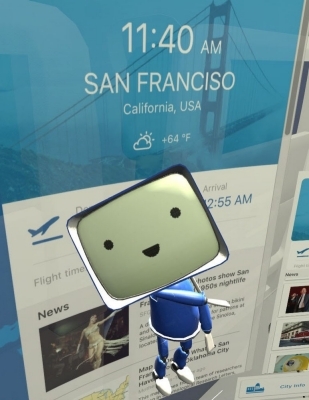 The application itself is an example of AR: Users would see the actual interior of their plane while also being able to interact with the virtual assistant. Movies, apps, menus and other forms of entertainment and amenities could appear on a virtual “screen” much larger than what the physical space would allow. So users might feel like they have more space to work with — making even coach seat seem a little bit roomier — without actually encroaching on the person’s seat next to them. Boeing Onboard's virtual assistant is similar to Alexa or Siri and can interact with users. These technologies also allow for the safety instructions to be specific to each user, highlighting the closest exit or simulating the deployment of oxygen masks. This not only makes these demos more useful, but it frees up the flight attendants to assist with other matters. In fact, actual flight attendants played a major role in the development of Boeing Onboard.The team interviewed Delta flight attendants from the Cincinnati airport throughout the semester, fine-tuning the work based on their feedback. This is an example of the “human-centered design” boasted by Live Well. All projects are made with actual users and consumers in mind, never in a vacuum. And naturally, the team worked closely with Boeing on this collaboration. Boeing’s Cynthia Vandewall works in product strategy and future airplane development. Each year she travels to Cincinnati several times per semester to work on Live Well projects. The opportunity to work on innovative real-world solutions is not just impactful for students, but for corporations like Boeing as well. Boeing Onboard could give users personalized safety instructions. DAAP professor Ming Tang and students Jack Qi and Andrew LeTourneau get feedback on their work from a flight attendant. Live Well’s focus on innovative technology, multidisciplinary work and co-creating with corporate partners makes it a perfect occupant for UC’s 1819 Innovation Hub. As part of a $38 million renovation, UC’s “new front door” to the community will serve as a space for students and faculty to engage with industry on collaborative problem-solving. Located in a 133,000 square-foot, four-story building that dates back to 1929 (1819 refers to the year of UC’s founding), the Innovation Hub offers a one-stop shop for industry to access the university’s extensive resources and is at the heart of UC’s “Next Lives Here” strategic direction. The UC Research Institute, UC Simulation Center and Cincinnati Bell are among the hub’s first tenants. The Live Well Collaborative is expected to join the hub this spring. Lane sees the move as a win-win. But first, the Live Well Collaborative has its sights set on the Crystal Cabin Award. Tang and Lane will soon travel to Hamburg, Germany, in the hopes of beating out two other finalists in the university category. Vogel sees Boeing Onboard as one of the most “future-feasible” projects out of Live Well, meaning the technology is very cutting-edge and it would take work to incorporate, but it’s all realistic and doable. Learn more about the Live Well Collaborative. Get involved with Live Well through co-op, a class or an independent study. Read about the 1819 Innovation Hub.